Hey there. Bruce Gall host of two great UK radio shows specializing in electronic music will air my track “Under The Moss 12” on his One World Radio show called Atmospheres 8pm to 9pm London time. Click on the word Atmospheres below to be sent to the streaming broadcast. Follow the link to check on your local time as this is airing in the U.K.
“Under The Moss 12” was made at Flaming Geyser State Park in my home area of Washington state. I was with friend and colleague Dean DeBenedictis (Owner of Fateless Flow Records and also known as Surface 10) at a spot we visited almost exactly one year earlier. The year before I recorded “Under The Moss” which I had made on my iPod Touch. The “12” is about coming full circle in many ways that are personal to me. We were literally under drapes of moss surrounded by beautiful green scenery with a pleasant bright, warm filtered sun shining above us, and a gentle running creek down the hill. Just like the year before. It was a great moment, and being able to revisit the same place as the year before was very special to me. I remade Under The Moss and added the “12” to signify the personal experience of how much had changed. This time Under The Moss 12 was made using my first generation iPad, with a couple portable speakers. Dean walking around quietly filming the experience. The track ended up cut down for Technopolis Lost as the full version was way too long to share. I hope you get the chance to tune in and hear it on air. 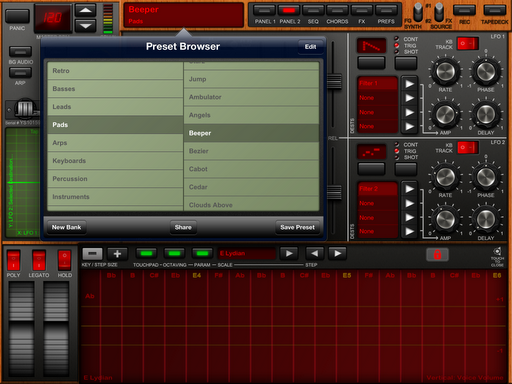 Magellan synth for iPad blazes the spice trail of sonic exploration like no other iOS synth of this era. 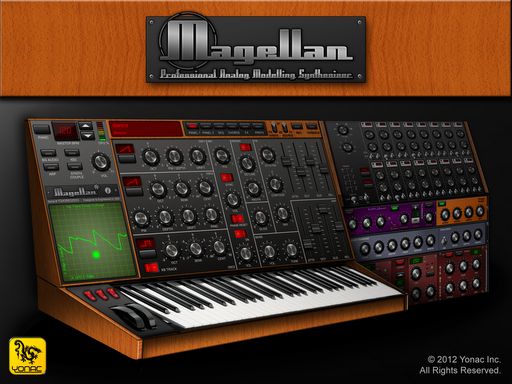 In short, Magellan is a 6 (3 per synth) oscillator, dual virtual analogue monster synth of exceptional quality with some of the most amazing sound possible. This is a big synth-no wait, 2 big synths-with all the goodies you would want or expect from a far more expensive real world version. 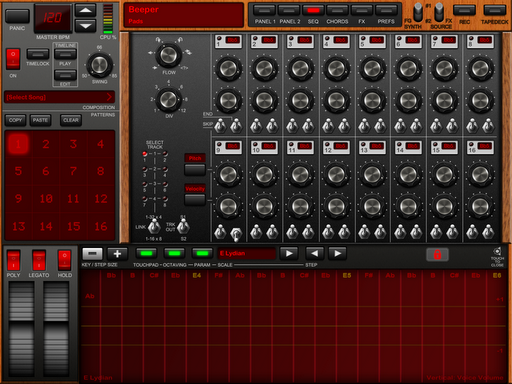 With 2 powerful virtual synths that can be played both simultaneously or independently via virtual keyboards or x/y pads, an extensive library of great preset sounds including 34 presets from Sunsine totaling 276, a full rack of silky FX, 16/32 step programmable sequencer, each synth engine has a dedicated programmable arpeggiator, really nice filters, envelopes, etc….oh, you know the stuff that is expected in a high end pro synth like this. It’s going to take a lot of screen space to list it all; visit iTunes or Yonac for the full list of features and be stunned. Magellan is like nothing we’ve really experienced on iOS. I’m still discovering possibilities as I play more and more with it. I’m finding it very easy to navigate and a lot of fun to explore a wide variety of sonic realms. A fully tweakable (love that word) selection of tools and included sounds, as well as an import option to bring in others, allows for some serious patching. The design of Magellan is retro in appearance; resembling hardware from the era it emulates. It looks good, but most important it works and doesn’t feel clunky or convoluted. Everything you need is contained smartly within the 6 tidy panels. Thank you Yonac. 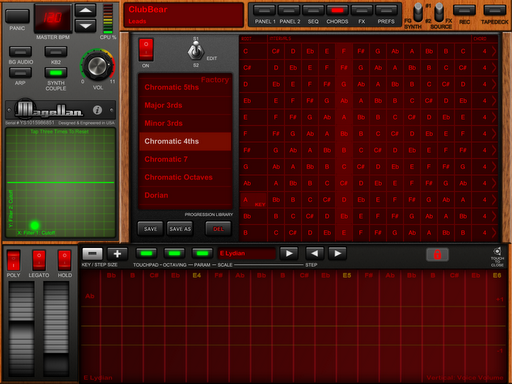 There’s a pretty nice dedicated chord maker (1 module per synth) with preset scales, customizable progressions that is easy enough to use. A very handy feature making chord creation or progressions quick to apply. Loaded with all the modern sharing options, like file share, audio copy paste, WiFi, email SoundCloud and extensive MIDI options. No Drop Box though. Magellan is designed to accommodate the needs and desires of its users. Create and record a complex song length sequence, sketch ideas, make loops, and play live, it’s all here. 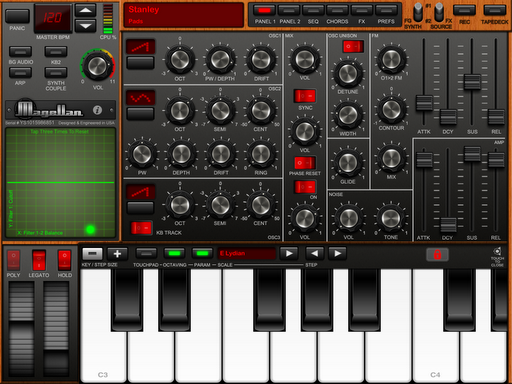 The big thing is that its 2 full featured virtual analogue synths when combined make for some very impressive sounds. Add to those a robust, equally high quality FX rack and it’ll put you in synth heaven. Played out on some nice speakers Magellan doesn’t fail to impress and bring a big smile to your drooling face. Selling very nicely at a modest launch price, it’s a small price to pay for anything half as powerful as Magellan, and it’s money well spent. 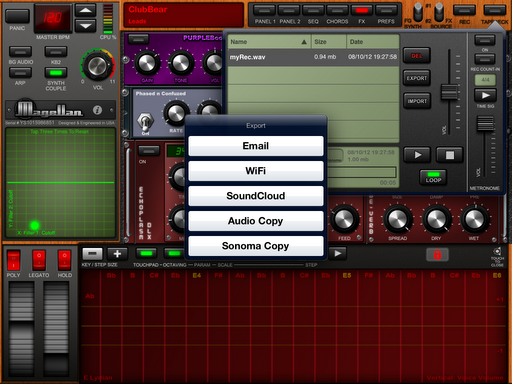 Sometimes virtual analogue synths on iOS have been a little disappointing or lacking that full, rich, phat sound. They’ve come close, but nothing quite like Magellan. For a fully armed beast like this, sounding as good as it does, it’s easy to recommend and consider Magellan a must have. What a joy. If you are looking for a big sound that sounds great, do yourself a big favor-click HERE to go buy it.